Shelley Ware is well known as part of the ground breaking NITV-SBS football program Marngrook. Shelley is also a well sort after Master of Ceremonies and a regular keynote presenter to corporations and events. Espousing her perspective on females in sport, Aboriginal issues, childhood education and her own journey. To enquire about availability of Shelley for your next event click below. 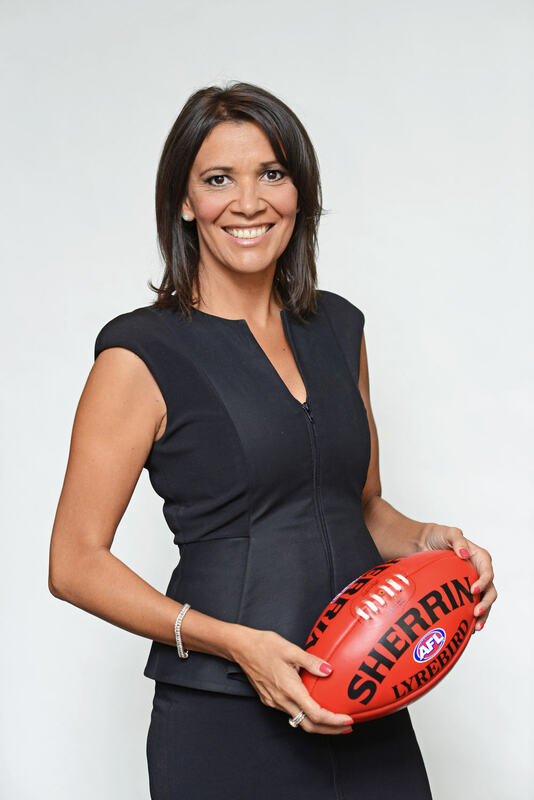 Shelley Ware is well known as part of the ground breaking NITV-SBS football program Marngrook which just celebrated 250 episodes and was nominated for Best Sports Program second year in a row at the Logies. Shelley is a regular corporate speaker to large and small groups. Speaking about diversity in the workplace, females in sport and Aboriginal issues and reconciliation, she is a dynamic and powerful presenter. To enquire about your next function click below. Also an experienced teacher at a Melbourne school, Shelley specialises in literacy programs for primary school children, both publicly and privately. Shelley loves to give back to the community through her passion for helping children be the best they can. For the past three years Shelley Ware has been a fabulous ambassador for the Jean Hailes Women’s Health Week. Women’s Health Week is dedicated to all women across Australia to make good health a priority and Shelley is passionate about this. She has supported Jean Hailes by filming promotional videos, attending launch events and promoting the week on Marngrook Footy Show. Shelley is a fantastic woman to work with, she embodies the spirit of our organisation and Jean Hailes is proud to have her as an ambassador.